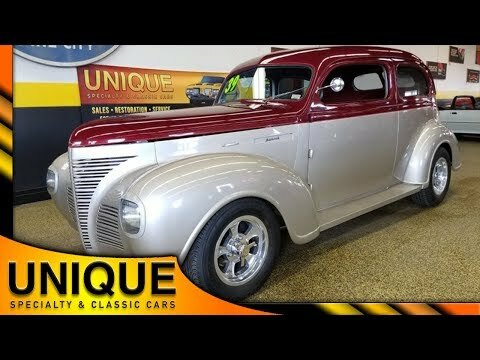 1939 Plymouth 2dr Street Rod powered by a 400 Chevy paired with a 350 Turbo automatic transmission. Aluminum radiator, Edelbrock carburetor, chrome valve covers equipped as well. Firewall is extremely clean and taken care of. 323 gears in the rear for highway cruising. This car is all steel including the hood, fenders, and running boards. Riding on Halibrand wheels with BFGoodrich tires. This car is a frame-off restoration with very few miles once it was finished. The whole thing has a 4-layer base coat and 4-layer clear coat. The two-tone champagne on silver paint looks great. Custom Flowmaster Exhaust tastefully done. Frenched-in third tail light and license plate area. The fit and finish of the lines on this car are very nice and show well. This hood would have been a three piece hood originally but this is a custom one piece that opens up like a normal hood! Door poppers on the fob. Interior is burgundy leather and is in great shape. The door cards, seats, carpet, and headliner are all in excellent shape. Dolphin gauges installed on the dash with chrome accents around them. The chrome steering column with newer style Banjo wheel that does have tilt steering. Custom ignition setup. Great running and driving Plymouth street rod!